Bhubneswar: KIIT Technology Business Incubator (KIIT-TBI), under KIIT University, organized a B-Plan Competition under the aegis of their Social Incubation Program – INVENT, a joint initiative of DFID – UK & TDB – DST, supported by Villgro. 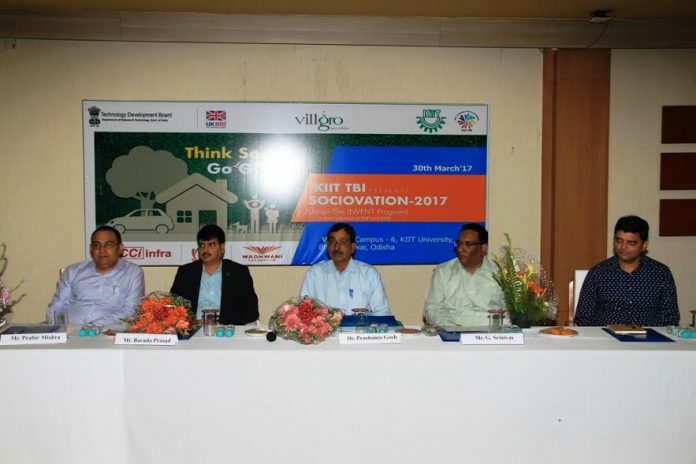 The Program was inaugurated by Professor Prasant Kumar Ghosh, Head of Social Work, Viswa Bharati University, Santiniketan in the presence of KIIT TBI team, industry partners, entrepreneurs and academicians. The keynote address was given by Mr. Srinivas G, Head INVENT, KIIT TBI. The program witnessed final pitch and flash pitch encompassing different entrepreneurs. The winners along with the finalists were awarded cash prize of Rs. 25,000 to Rs. 1.00 lack. Representatives from different E-cells of Odisha, early stage entrepreneurs, academicians and Industry partners attended the programme. Among others, Mr. Subhrakant Panda, Chairman – Odisha FICCI Council and Mr. Subrat Nayak, Chairman, Environment & Social Development Panel, NOCCI spoke on the occasion. The speakers emphasized on the social enterprises eco-system and KIIT TBI’s role in fostering the connect.